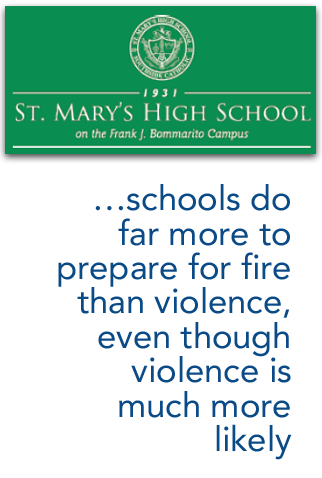 Founded in 1931, St. Mary’s is a Catholic High School located in St. Louis Missouri. The all boys school sits on a 27 acre lot and has had more than 12,000 graduates. Their mission is to provide a safe and secure campus for their students to learn and grow both academically and spiritually. A mission of St. Mary’s is to provide a comprehensive program of learning which challenges and motivates each student to reach his fullest potential. The school is dedicated to maintaining a community where everyone involved in the students’ formation collaborates to create a climate of cooperation, respect, openness and trust. of St. Mary’s along with the faculty and staff have a safe environment to work toward their goals. As St. Mary’s sits in a high-crime neighborhood and with school violence always a top-of-mind for school administrators, they wanted to make sure that they were doing everything they possibly could to make sure that they were providing the students with an environment where they could be assured that unwanted intruders wouldn’t be able to make it into the building. President Mike England attended a safety seminar where an expert speaker acknowledged that schools do far more to prepare for fire than violence, even though violence is much more likely. With more than 1,400 facial readings conducted per day, the system is working exactly as the school administrators had hoped. The system is mounted between the double doors at the school’s two entrances. Students have said that although they never felt particularly unsafe at the school, the cameras offer them the feeling of extra security. The product reads faces entering the building in real time with no need for the subject to pause. This makes for a very non-invasive solution. 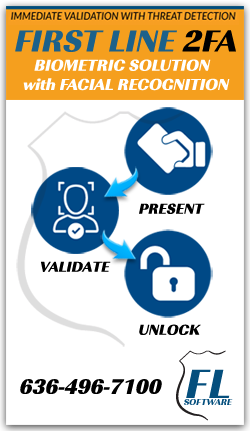 Unlike similar solutions that require an access card or a key fob, with First Line Facial Recognition, there is no need to worry about losing a card or a fob being stolen. Blue Line’s system is the fastest, most accurate access control system available. The school has never had a serious security problem, but now with the First Line Facial Recognition system installed, it gives school administrators peace of mind that an event is now even more unlikely. In addition to the all of the people who regularly visit the school being placed into the system (mail carriers, delivery personnel, contractors, etc. ), local law enforcement officers who regularly patrol the area hve their faces documented, giving them immediate access in the event of an emergency. The system can now manage any problem parents, especially if there are any restraining orders that are known. First Line Facial Recognition works to document any students that leave school early and can message parents. Additionally, First Line Facial Recognition offers parents of the students a comfort to know that the school they send their children to cannot be entered by just anybody. “We’re proud to be the first school in the nation to install facial recognition technology and we hope that more schools follow suit,” continued England.